Beauvezer means "beautiful to see" and one has to admit that the homogenous architecture of the village allows one to confirm the title of "perle du Verdon" which is sometimes given to the village. From the Middle Ages, the women of the village, during the long winter months, worked in their homes with the wool collected from the thousands of sheep which grazed the lush pastures . This home-made production responding initially to the needs of the community, quickly took on a much greater importance with the commercialisation of their goods in Provence and in the Savoy states. From the XVII century the communes of the Upper Verdon, Beauvezer and Colmars in particular, were important spinning centres. The mechanisation in the 1830's completely changed the countryside : an industry was created. Unfortunately, transport development failed to keep pace with this expansion and the gradual closure of the factories led many families to seek employment elsewhere. Today, only the large factory buildings are witnesses to a flourishing era of relative prosperity for the valley. Previously, the village was constructed on the hillside where now the only remains are the chapel of Saint Croix (private property). After a terrible fire which even melted the church bells according to legend, the village was reconstructed in 1728 in its modern position. It must be noted that Beauvezer was one of the first sites in the area to have integrated tourism into its economy, thanks to its recognition and classification as a "station climatique" by the Academy of Medicine in 1925. Beauvezer is tucked in the centre of the Upper Verdon valley, between Allos and Saint André les Alpes. 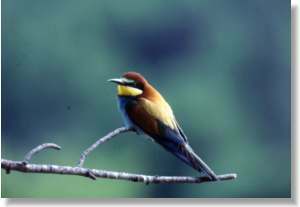 The orientation of the valley is north-south, and its altitude is between 1000 and 2000 metres, with our village situated at 1175 metres. The mountain range which dominates the valley is about 2500 metres on average, culminating in the highest peak, Mont Pelat which is 3051 metres above sea level. The many valleys adjacent to ours, have rivers which drain the surrounding summits into the Verdon. For the 300 000 years when glaciers covered Europe, one of them occupied the area which is now the Upper Verdon Valley, eroding the soft rocks and scouring out the precipitous cliffs we see today. Many autochtonal formations made up of thin layers of limestone alternating with clay beds, give us the cliffs which are covered in scree and sharp pointed rocks. From the quaternary era we have inherited scree slopes and "cônes de déjection", typical of the commune of Beauvezer. High altitude streams (between 2000 and 2500 m high) give birth to the Verdon on the slopes of "la Sestrière". The 570 km2 catchment area of the Upper Verdon is situated for more than 80% of the area at over 1500 m.
The rivers drop is 9.3%, and its average annual flow is 9 m3/s at Thorame-Haute. 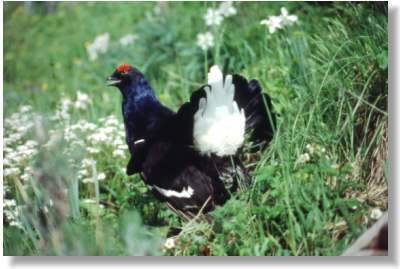 It is for these reasons that the Verdon is highly capricious, and if at certain times it resembles a quiet stream, at other times it is a raging torrent ! 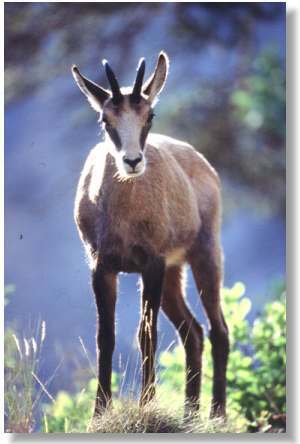 As throughout the whole of the valley, Beauvezer has an abundant and diverse fauna. 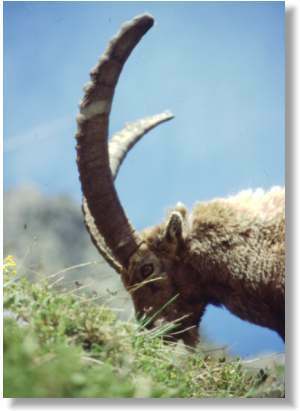 The large ruminants (ongulés) : chamois, mouflons, ibex (bouquetin), red deer (cerf), venison (chevreuil) share the territory with the wild boar (sanglier). 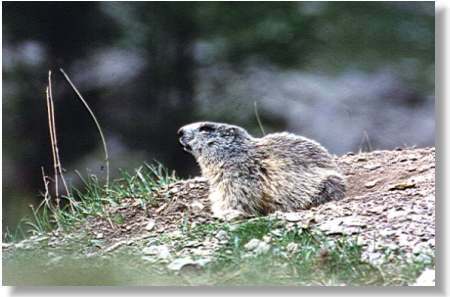 More modest sized mammals also contribute to the diversity of this area : the marmot (marmotte), the hare (lièvre variable), the stoat (l'hermine). 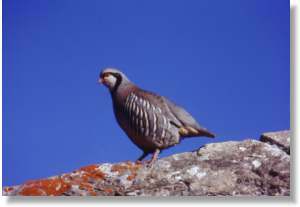 Birdlife is composed of a great number of species : Blackcock (tétras lyre), ptarmigan (lagopède), bartavelle, chocard, without forgetting the majestic birds of prey, royal eagle (aigle royal), circaète, buzzard (buse), owl (chouette)…. Here are some photos which attest to their beauty. The insects here are very interesting, as they exhibit colours which are much more vivid than elsewhere. 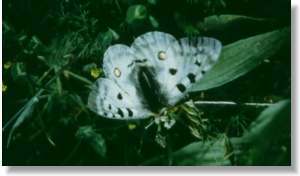 Butterflies are especially remarkable and amongst these, the apollon, with large rounded white wings like white gauze, marked with red and with black circles, with its abdomen hairy like a catkin !